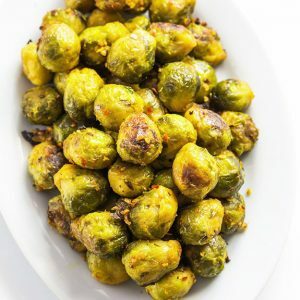 Bring a large pot of lightly salted water to a boil, add the Brussels sprouts and cook for two minutes. Drain well and place the Brussels sprouts in a large bowl. Add the minced garlic, cayenne pepper, and melted coconut oil and gently toss to coat. Transfer the Brussels sprouts to a baking pan and sprinkle with salt. Bake for 15-20 minutes, shaking pan occasionally until sprouts are quite brown and crisp on the outside and tender on the inside. Adjust the taste with more salt if necessary, drizzle with lemon juice, toss to combine and serve.